Although Barnardo had opened his Girls' Village Home in 1876, it was not until 1909 — four years after Barnardo's death — that a comparable establishment for boys began life. The Boys' Garden City, as the new home was named, was built at Woodford Bridge in Essex with much of the construction labour force being supplied by boys from the Stepney Boys' Home and Labour House. As with the Girls' Village, Woodford Bridge adopted the "cottage homes" principle with the boys living in family-style groups each under the supervision of a resident house-mother. The Garden City was officially opened in 1912 and eventually accommodated around 700 boys, about half the number housed in the Girl's Village Home. 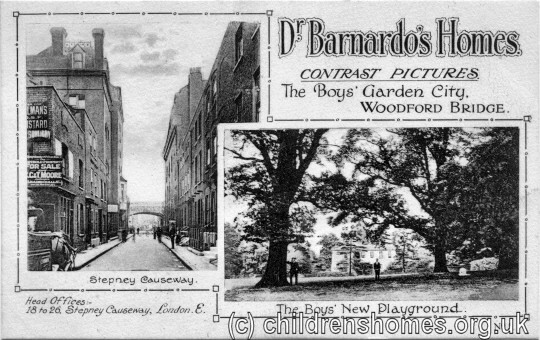 The boys' move from the confines of Stepney Causeway to the green spaces of Woodford Bridge was celebrated in a series of publicity cards issued by Barnardo's. The Russell-Cotes Sea Training School was opened in 1919 at Parkstone in Dorset to train boys aged 13 to 16 for entry into the Merchant Navy. In 1922, the ageing industrial training facilities at Stepney Causeway were replaced by the William Baker Technical School, located on a country estate called Goldings near Hertford.